There is this sea giant that leaves the harbour like a huge white whale which shines in the sun. On the back, thousands little figures greets waving their hands. Arrivederci Genova. A city that is like all the other big cities: really beautiful in its intimate heart. Today down there the Giro arrived. And now that the sun makes the water shine and light up the houses on the hills, I can still feel people’s roar on the finish line, the endless arms outstretched towards the hurdles. I shudder thinking about it again. Thinking again about what cycling does in a afternoon like many others: it overturns the rules, stops everything, takes time and delete it. Fatti sentire, Genova here there are the guys you waited for. Glistening with sweat and effort under a sun that seems full summer, maybe with the shorts ripped by a fall, some blood mixed with kilometres. I have to admit that sometimes I am afraid. To loose all of this, to wake up one day and feel that there is nothing left, that I’ve burnt too much and nothing has remained. Is not easy to look always with new eyes. Nevertheless now that this cruise ship leaves slowly the port and throws her huge shadow on the quay, I think that shadows flow. Faster o slower. Mine have been taken away in a blink of an eye by some things that make this sport tenderly special: the trembling adrenaline of the finish line, dads who hold the children on their shoulders, the wait which dissolves in a trice after the arrival and everything else. 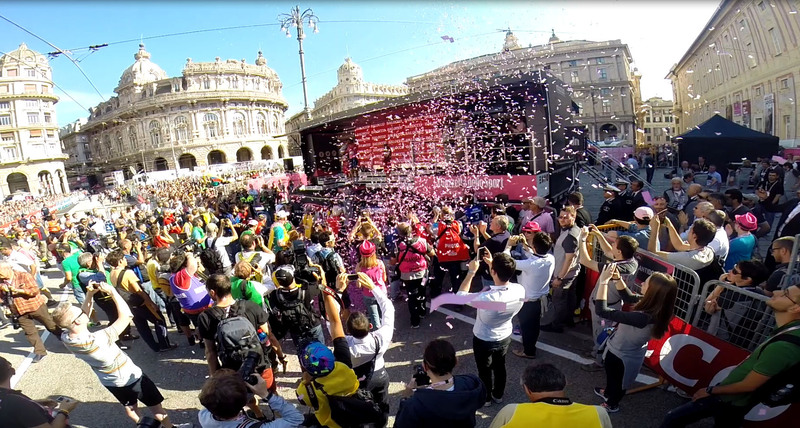 The confetti, the wine, the people all around. This is what matters. Goodbye Genova with your improvised musician on the roadsides. Towards Milano there is the Appennini’s air that comes in from the windows. The phone doesn’t work in this lonely place cut off by the freeway. There are the Gun’s. Take me down to the Paradise City. I feel good, goodbye, I’ll be back soon. To go, come back. And recover themselves. This is the trip.